Achieve complexion perfection with Smashbox Color Correcting Sticks! 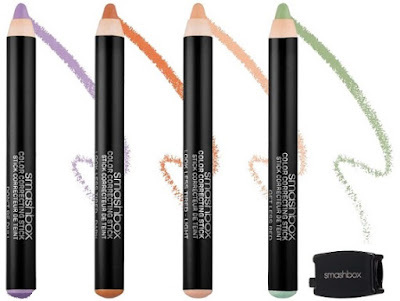 Smashbox Color Correcting Stick - $27 - in 4 shade that target an array of skin concerns: Don't Be Dull - lavender - brightens sallowness/yellowness, Look Less Tired - Dark - orange - illuminates and conceals dark circles and hyper pigmentation on deeper skintones, Look Less Tired - Light - peach - illuminates and conceals dark circles and hyper pigmentation on light skintones, Get Less Red - green to reduce redness. The stick format makes them easy to use and offers precise application. While the creamy, buildable formula is infused with moisturizing vitamin E to blur the look of fine lines and pores for radiant, perfect-looking skin. Use wet for a sheer to medium coverage or dry for full coverage and just don't forget that they need to be used with foundation or concealer - nothing is less natural looking then green or purple skin! You can either layer the corrector underneath or mix a bit of the corrector with your concealer or foundation on the back of your hand and apply with a brush or finger.